Bank of America is reducing its outstanding share count twice as quickly as Wells Fargo. Bank of America's headquarters in Charlotte, North Caroline. Image source: iStock/Thinkstock. Bank of America (NYSE:BAC) doesn't have many advantages over Wells Fargo (NYSE:WFC), but there's one place where it does: share buybacks. Thanks to the low valuation on Bank of America's stock, it's able to get much more bang for its buck compared to Wells Fargo when it comes to repurchasing common stock. Since the beginning of the year, both of these banks have consistently bought back stock. Bank of America has repurchased 168.5 million shares for a total of $2.4 billion while Wells Fargo has bought back 96.5 million shares for $4.7 billion. Data source: Quarterly regulatory filings. These numbers alone illustrate Bank of America's advantage. Even though the North Carolina-based bank has spent half as much on buybacks thus far this year compared to Wells Fargo, it's been able to retire close to twice as many shares. 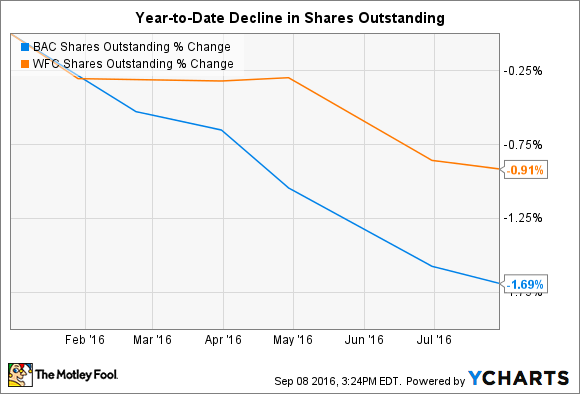 Here's another way to look at it: Since the end of 2015, Bank of America's outstanding share count has dropped by 1.7%. Wells Fargo's is down only 0.9%. BAC Shares Outstanding data by YCharts. One reason Bank of America's buybacks have been so effective is because its shares are priced at a substantial discount to book value. They trade right now for 33% below book value -- and that's despite a steep rally in its stock price since the end of June. Consequently, over the six months from January through June of this year, Bank of America was able to buy back its stock at an even steeper 40% discount. Wells Fargo has faced the opposite situation. Thanks to its history of high profitability, its shares trade for a 30% premium to book value. And that's after they've fallen in the wake of its recent scandal. For most of the year, they traded at a 40% premium, which is right in line with the multiple at which Wells Fargo has repurchased its stock. It's also worth pointing out that Bank of America's stock repurchases have resulted in a comparatively larger decline in its outstanding share count because it issues fewer shares to employees in lieu of cash compensation, which offsets the impact of buybacks. The difference in this regard is stark. Bank of America has issued only 5 million shares this year, equating to less than 3% of its buybacks. Wells Fargo, meanwhile, has issued 38.7 million shares, which is equivalent to 40% of its buybacks. In sum, while there are many reasons to pick Wells Fargo over Bank of America if you're an investor, the one thing that could propel Bank of America's stock faster is its ability to repurchase its outstanding stock cheaply without having to materially offset the impact by issuing a copious number of new shares.